LOS ANGELES — Are you not entertained? The question shrilled out at the end of a Jeep promotional video Wednesday morning as lights flashed, music blared and three never-seen-before vehicles crawled their way on stage during a press conference at the Los Angeles Auto Show. They moved slowly, preening almost, to the hundreds in attendance who lifted cell phones and cameras high to capture a glimpse. And all the while those vehicles seemingly dared anyone taking pictures not to be interested. Not to be intrigued. For those vehicles, and indeed the designers and company who made them, know just how special, how entertaining, they can be in an important – and growing – midsize truck market. Jeep calls them the 2020 Gladiator lineup. A truck series that packs all the capabilities and style of its award-winning Jeep Wrangler into the everyday best aspects of a functional pickup. All to achieve what it believes will be sales success. The Gladiator is Jeep’s first pickup offering in 26 years, and it appears FCA worked hard to design something that wouldn’t get lost in the noise thanks to class leading features like high-end towing and payload capacity, open air freedom, rugged utility, clever storage options and a bunch of safety and technological features. Like Wrangler, it will also have several different trim levels in Sport, Sport S, Overland and Rubicon, with the price – and benefits – increasing from Sport to Rubicon. Jeep has not released pricing information on the Gladiator. According to Jeep, the vehicle will arrive with 7,650 pounds of towing capacity (7,000 for Rubicon) and 1,600 pounds of payload capacity, putting it at the head of the class over competitors such as Toyota Tacoma, Chevrolet Colorado, GMC Canyon, and Ford Ranger. It will also be the only convertible truck on the market, with both a removable hardtop roof or a fold-back Sunrider soft top. The Gladiator’s doors will be removable, and its windshield can fold down – just like its Wrangler brother. All-in-all it will provide owners with a full open-air experience that no other truck can currently offer. Additionally, Jeep Gladiator is mimicking the Wrangler with its nearly unique body-on-frame design, and will offer an all-new frame that stretches its length 19.4 inches over the JL Wrangler in order to make room for a five-foot traditional steel bed. In all, the Gladiator’s length tops out at 281 inches, which makes it the longest Jeep vehicle currently on the market. To accommodate this extra length, as well as to bear the extra cargo weight and tow capacity, Jeep has incorporated an all new five-link rear coil suspension that features two upper and lower control arms located under the frame rails, and forward-facing rear track bar. Jeep says this set up also helps improve ride quality. From headlights to the cab’s rear, it appears the Gladiator has borrowed extensively from the JL Wrangler's look, including the iconic seven-slot grille, raked back aluminum windshield, aluminum hood and doors, as well as 7” round headlights and turn signals on the front portion of the flares. However, due to the cooling demands of the truck while towing, designers had to make the grille slots wider on the Gladiator, while Rubicon edition owners will see a unique forward-facing camera – perfect for those who spend a lot of their time off-pavement and need that extra visibility. The Gladiator’s cargo area also offers several handy features such as Jeep’s Trail Rail cargo management system, external power source, under rail lighting, integrated tie downs and available tonneau cover. Its dampened tailgate even includes cleats that can clip on and adjust to different open positions. One thing you won’t see on the back, though, is a spare tire. Jeep has relocated that spare rubber under the vehicle, and has provided enough space down there to accommodate up to a 35” tire for those who plan to upgrade. All Gladiator editions will come standard at launch with Fiat Chrysler's long-running Pentastar V6 engine which provides 285 horsepower and 260 lb.-ft of torque. Also standard will be a six-speed manual transmission, while an eight-speed automatic is available as an option. Jeep does plan to introduce its 3.0-liter EcoDiesel V6 engine sometime in 2020, which may be the perfect mate with the vehicle’s top-rated towing capacity. The EcoDiesel throws out a decent 260 horsepower, but where it really shines is with its 442 lb.-ft of torque. Both engines will also utilize Electronic Stop/Start technology, same as the Wrangler JL. Other available features for the Gladiator are Jeep's Command-Trac and Rock-Trac four-wheel-drive systems, Dana 44 axles, front and rear axle lockers, a limited slip differential, electronic sway-bar disconnect, and 33-inch off-road tires. Jeep has even given Gladiator a brand-first, high speed off-road calibration which allows drivers to keep the front sway bar connected, while unlocking the front differential and electronically locking the rear. All of that means the ultimate in high-speed traction over both dirt and sand, Kuniskis said. For those rock crawlers out there, Jeep lists the vehicle as having a 43.6-degree approach angle, 20.3-degree breakover angle and 26-degree departure angle – with 11.1 inches of ground clearance. 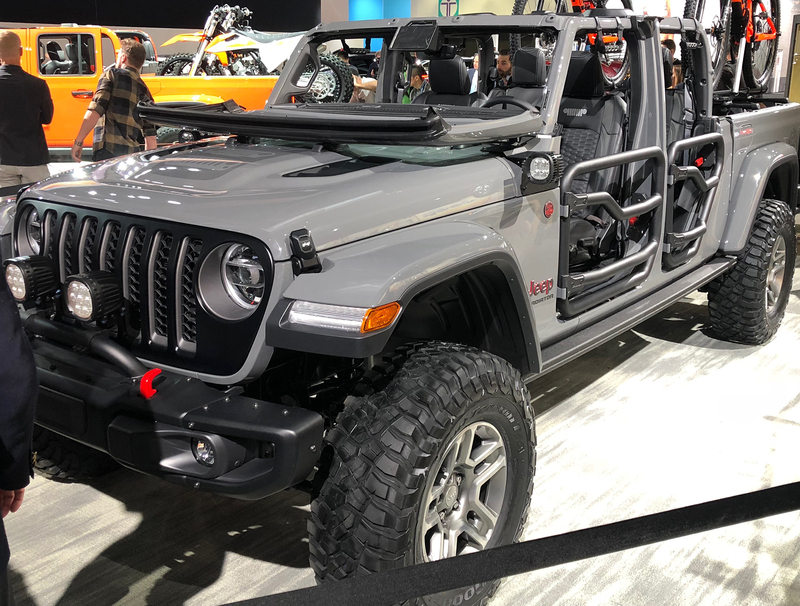 Inside the vehicle also nearly resembles the JL Wrangler, but the Gladiator includes an underseat storage system, folding rear seats that expose additional lockable rear storage and an optional removable Bluetooth speaker. That tremendous demand also appears to be the prime factor for Gladiator finally reaching the market, at least according to its head designer. FCA plans to build the Gladiator alongside the Wrangler in Toledo, with production beginning early in 2019. The vehicle is expected to reach dealerships in April 2019.